In 1782, the average wage of a Captain of a coastal trading vessel would be about 33 shillings a month, and the crew, depending on their experience and / or age, from 8 to 30 shillings. By 1802 this had dropped to 31 shillings or less for a Captain, and the crew wages had fallen accordingly. But ten years on in 1812 things had improved considerably with an average wage of 55 shillings for a Captain, and his crew between 8 and 50 shillings. Things steadily improved throughout the 1800’s, and by 1865 an experienced seaman could be earning between £3 and £4 a month, a Mate between £3.10 shillings and £5, depending on the size of vessel. And a schooner Captain would get £5 to £8. A boy’s wages would depend on his age 14-16, 12 shillings. 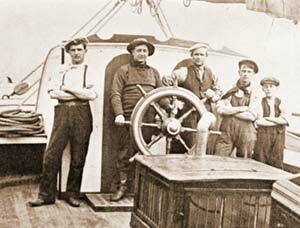 16-17, 14 shillings, and at eighteen would get between 15 and 20 shillings a month, and boys as young as ten were employed as cabin boys, but mostly on “deep sea” vessels. The Master could also receive a “Gratuities” payment that could work out at anything from £5 to £10 a load; there is an example from 1822 of a Captain from Caernarfon, who was given a “Gift” of £5.5 shillings (five guineas) for delivering a cargo of fruit safely to London. And this was a common trend throughout the nineteenth century. The wages were always higher on coastal vessels, (up to ten shillings a month more than deep sea) as the work was harder. Seaman would often discharge cargos, so they had very little time off in port. Plus their work was very much seasonal, and they would be lucky to earn six months pay in any year, and in that time they would only get the odd day off to go home. Apprentices were employed on most ships, and there’s a good account from June 5th 1826 of a seventeen-year-old farmer’s son from Llyn, that got a four-year contract on a small local coasting vessel. He would be paid £32 total, £4 for the first year, £6 for the second, £10 for the third and a final payment of £12, plus a new pair of trousers and jacket every year. For this he would be shown the entire seamanship craft, but there was a catch. He was not allowed to drink alcohol, or even enter a Public House, Inn, or Brothel, was not allowed to play cards or dice, or do anything that was against the law, and to cap it all he wasn’t even allowed to get married!! If he broke any of the rules, he would be dismissed, and would have to pay back all his earnings. But on the other hand, if the owner broke the contract, he would be paid the £32 in full. This was the law up to 1849, after this time, ship owners were not obliged to carry apprentices, but of course a lot of them still did. After 1850, most boys would go away to sea as cooks, (and were as young as 13) then they would learn their craft, and work their way up to ordinary seaman, then able seaman, and maybe on to become mate or even captain, which many of them did. In 1890 the wages of seaman went up across the country and again in 1910, as there was a great demand at these times for seafarers.